One thing that I really love about all the amazing nail blogs that are out there now, is the endless source of fantastic nail art inspiration. Today's mani is exactly that. 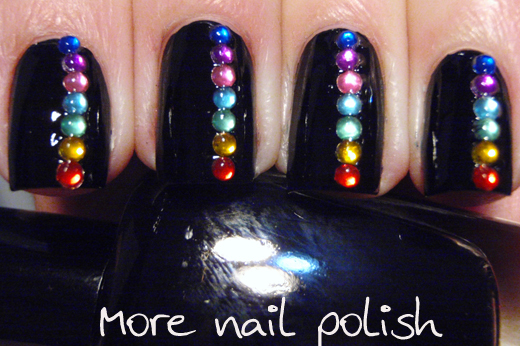 Inspired by another blogger (Kayla Shevonne) who was also inspired by another nail blogger (solensdanserinde) and her pin on pinterest. 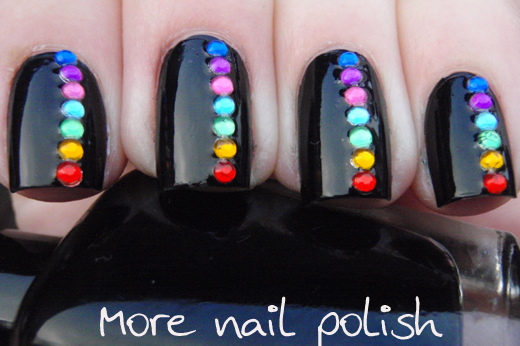 This mani is just a simple coat of a black creme polish and then individual rhinestones placed in a rainbow order. I can't remember where I got my wheel of rhinestones, maybe it was ebay, but I do remember that it was only a few dollars and that they are really easy to find. 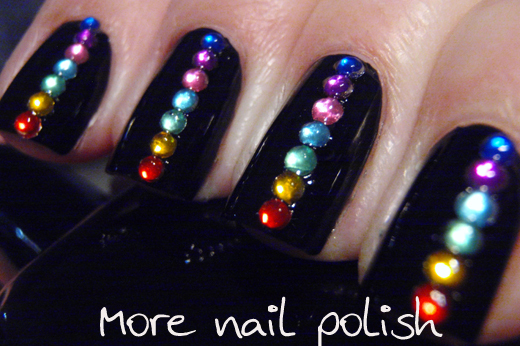 When I placed the rhinestones I painted a line of a regular top coat and placed them on using a pair of tweezers, it was amazingly easy to do. I finished it off with a coat of Seche Vite. I originally planned to make this matte using a matte top coat, just like both the original designs. But I just couldn't stop looking at it while it was so shiny and gem like. Mr 4 even commented on my nails today saying "Mummy, look at your nails! They are bewwfull. You should wear them every day". Thanks for all the nail inspiration ladies. So bewwful Cathy!! Haha actually they are very nice!! very eye catching!! 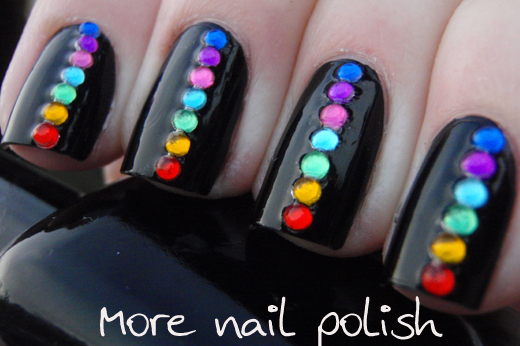 I wanna try it polka dots instead of stones!! I write about your blog in my blog. I like it!! I loooove the rainbow gems, so pretty! Ohhh, I love these soooo much!! The original matte version, too. Amazing! Niiiice! so simple and SO stunning...may have to try this with dots of color! Mr. 4 is right! Those are awesome!! I agree with Mr 4. 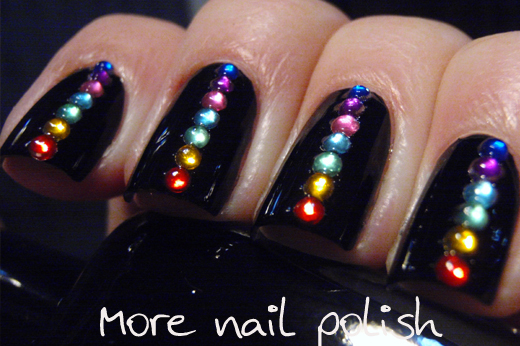 This mani is gorgeous. ohhh that is one look i recreate! your mani is looking awesome!! Brilliant, love it, i've pinned it! Great tip. I got a bunch of rhinestone i got from www.crystalsrus.com that have been just sitting in my draw. But now with your new idea i can pull our the rhinestone case and get crafting. love the idea. Thanks. Give us a great new way to use our products in our workshop classes. But for the tip i may give some for free as you have been so generous with your ideas.